As a follow-up to my last post on What Your Employees Aren’t Telling You, let’s explore why the front-line’s strong knowledge of customer requirements doesn’t consistantly translate into better service delivery. 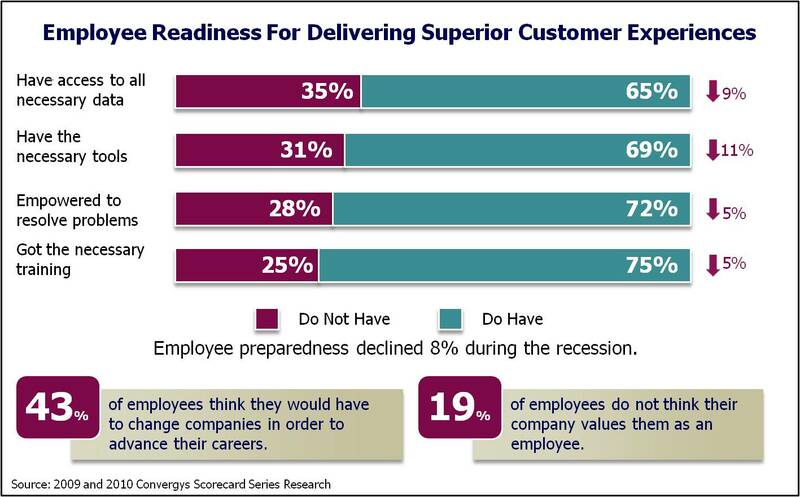 The customer experience research I directed last year (http://bit.ly/oDzXg8) showed that, across all industries, consumers may be perceiving declines in service, understanding and listening – and increases in effort – because front-line employees are less and less prepared to help. 35% of employees at large companies say they do not have access to necessary data to help customers, 31% don’t have the necessary tools, 25% didn’t get necessary training, and 28% are not empowered to resolve problems. These negative percentages have all increased during the recession as companies pulled back from front-line investments. Consumer perceptions aren’t the only casualties. Employees are less likely to agree that their companies value them and more likely to think they would have to change companies in order to advance. The key takeaway: Companies must reverse the trends and invest in their front-line employees. Employees must be trained, equipped, and empowered to deliver superior customer experiences, or consumers will look for better service elsewhere. This entry was posted in Customer Experience, Customer Experience Research, Customer Service and tagged Customer Experience, Customer Experience Research, Customer Service, Employee Experience. Bookmark the permalink. Lorena, great post. Please let me know if I can repost this on Customer Service In The Cloud. http://www.customerserviceinthecloud.com. Would be delighted to point it to your site. Thanks.